You can now register for the first CEPIC Congress in Paris in collaboration with PIXDAY from 5 to 7 June 2019! Attended by picture agencies, technology providers, picture buyers, and picture professionals worldwide representing all areas of the image licensing industry. On the first day of Congress, 5th June, you will have access to PIXDAY – the largest picture buyer event in France – with your CEPIC Congress pass. This is a unique opportunity for agencies to develop their network as well as their knowledge of the French market. Meet over 250 agencies from around the world, as well as French picture buyers representing all the sectors of the industry, including the press, publishing companies, communication agencies, and new media in one single table area that remains one of the most active picture markets in the world. Booking one of the 70 tables is highly recommended this year as CEPIC Congress and PIXDAY will share all areas of the Congress venue – Salons de l’Aveyron in Bercy – on 5th June. Make sure you have your own table for meetings and get noticed. If you are a French agency or an international agency with an office in France, we have a hot deal for you this year. 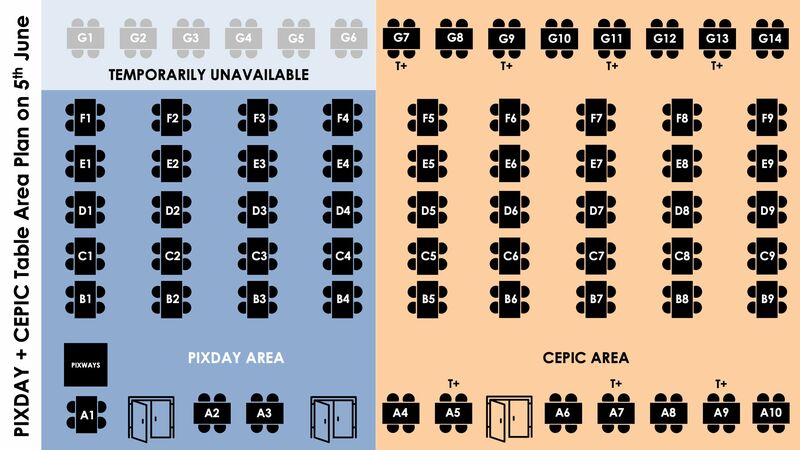 Register for PIXDAY – including three passes and a table on 5th June- and then add as many CEPIC passes and tables you want for 6th and 7th June. If your agency attends both events every year or if you have always wanted to know what the CEPIC Congress is about but could not afford the travel and accommodation costs, this is an offer you can’t miss. On 6th and 7th June, the table area will go back into CEPIC Congress mode with two more days of non-stop agency meetings. This year – for the first time – we will offer tables for two days of Congress (6th and 7th June). The number of two-day tables available will be published and ready for booking in March. From Wednesday 5 June to Friday 7 June, CEPIC’s programme will address the different segments of the photo business, stock, news and cultural heritage and their major fields of interest: Business and legal environment, Business models, Technology, and Creativity. On Day 1 a common conference Pixday – CEPIC, partly in French and partly in English, will be devoted to “Market and Creativity” and the “Challenge of Finding the Right Image”. This conference will be open to picture buyers. Day 2 is “Technology and Standards Day”. This second will feature the traditional IPTC Metadata conference and look where we stand with the usage of Metadata in 2019. On Day 2 and Day 3 more workshops are planned addressing the specific challenges of the cultural heritage and of the news sectors. This programme is work in progress. If you wish to contribute with your expertise, sponsor one the workshops or organize your own event, please write to paris2019@cepic.org ! We will close the 5th June with the PIXDAY Afterwork Drinks right at the Congress venue. On 6th June all registered delegates are invited to the CEPIC Soirée at Bercy Village. The exact location will be announced soon. Link your brand to these events by becoming a sponsor. Contact us and we will prepare an offer according to your needs.